I share projects that I'm working on and sneak peeks pretty regularly on my Instagram Stories, but I realized you all don't usually see little bits and pieces of what I'm working on until I'm sharing the finished product. So today, I thought I'd share a few of our works in progress with you, too! 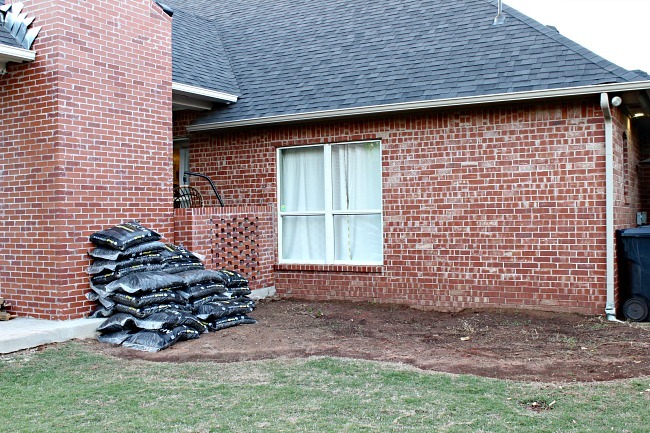 Last year our outdoor focus was on the patio, and since it's all finished up this year we're focusing on on our back yard landscaping. We've done a few things here and there over the years, but that basically consisted of plopping a few knockout roses in a bed and calling it good. The roses all got diseased last year, so we tore everything out and we're starting from scratch in the back yard. and enlarged the bed that is on the other side behind the patio fireplace. That's the side with the gate to the front and where we keep our trash dumpsters and firewood stack, so we're going to try to be strategic with our planting to hide those more unsightly things on that side a bit. You can see that we've already stocked up on mulch, did you catch the 5 for $10 sale at Lowe's this week? 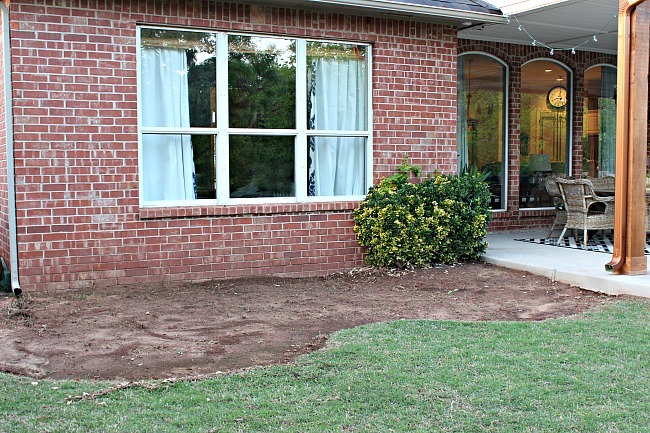 We've been working to kill the grass in the new beds and hope to bring in a load of good dirt to mix in this week so we can start planting, and I'm planning to use some of the brick from the old patio to line the edge of the bed. I also need to get something planted in these pots this week. Last year I had hibiscus in them, but I'm leaning towards planting some type of small evergreen tree in them so they'll have color year round. I'll be checking out some options but if anyone has a suggestion for evergreens that do well in containers (in Oklahoma) I'm all ears! We also replaced the bushes in our front flower beds last week. I've had Indian Hawthorns in these beds for a few years but wasn't loving them there, and wanted to put in boxwoods to start a hedge. These were a really nice size and I found them for only $15 each at Walmart. I'll let them grow for a while and then start trimming and shaping them up. We saved the bushes we took out and I'll use those in the new beds in the back yard. The other project that I'm super excited about is our new front door. We've been wanting to replace our current door for a while. After starting a preliminary search for one, I realized that exterior doors are expensive!! I totally understand the value of a good, solid door, but we don't really need a new door other than feeling like ours is getting dated, is pretty common for our area, and is not really our style. We DO need new windows, which will also be a huge expense, so I thought I'd explore some options to save money on a front door. I was not concerned about losing the glass in our door at all, in fact, I wanted a door with no glass. With the sidelights and big dining room window right next to the entry, we have plenty of light coming in already. Plus, with the oval window, most wreaths and door hangings always looked a little awkward. And, now I can find a really cool brass door knocker to add to the front. I've been ready to move away from black on the door as well, and here's some inspiration for where I'll be headed. 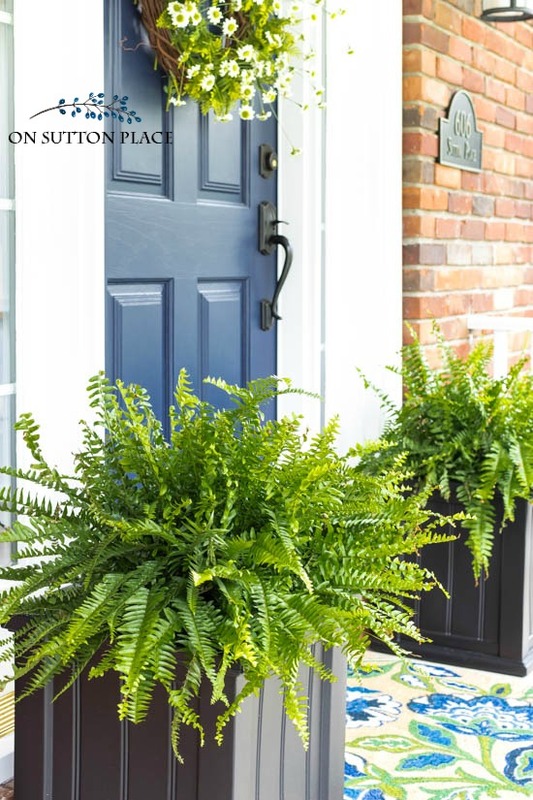 Ann from On Sutton Place has so many similar things at her house that help me to see this color combo would work for me... similar brick, black planters and light fixtures... my shutters are black too and I think the blue will be a nice pop of color on the exterior. Isn't her new Spring wreath pretty, too? 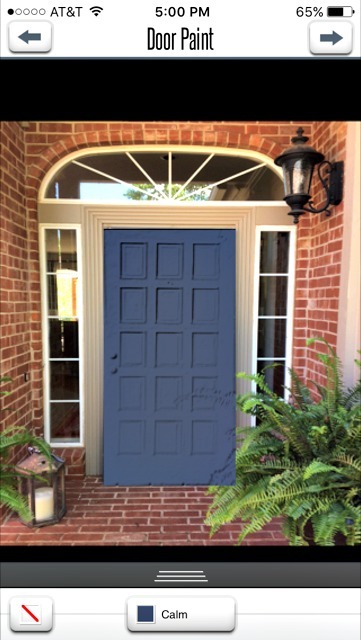 Modern Masters is a company that sells specialty front door paint, that doesn't fade and dries quickly so you can paint a hanging door without removing it. I found this free Front Door Paint app (for iPhone or Android) on their site to test out some of their colors. I think the colors in the app are a bit off from how the colors appear on their website, but it still gives me a pretty good idea of what it would look like. Imagine a brass handle and fun door knocker... I can't wait to get this project done! Other than that, I've been cleaning out nooks and crannies in an effort to majorly declutter, and preparing for a huge garage sale! This past weekend I hit the attic... does anyone else have an attic full of Lego boxes that your child won't allow you to throw out? ;) Hope to show you some progress on these projects soon! 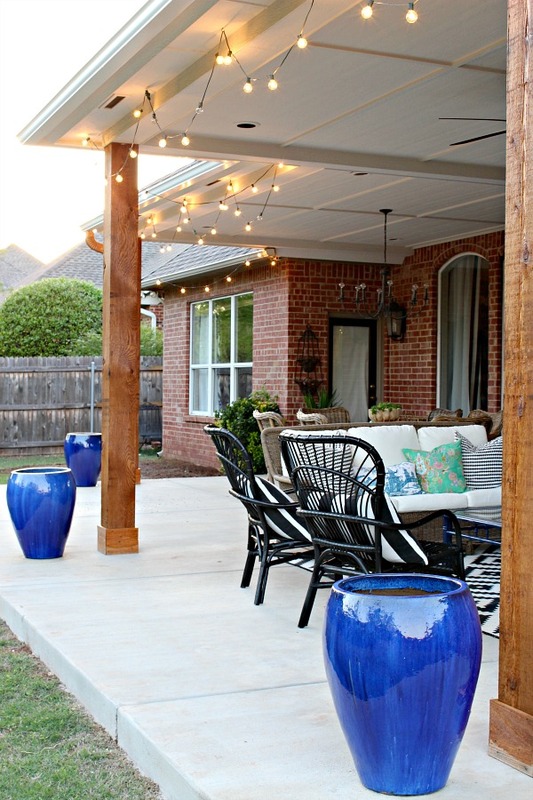 i love your back patio SOOOOOO much! and i love the shapes of the beds you dug! Love the new door. You always find great second hand items. Such a good eye! Well done on the door! We need a new one so badly, but it's SO expensive. 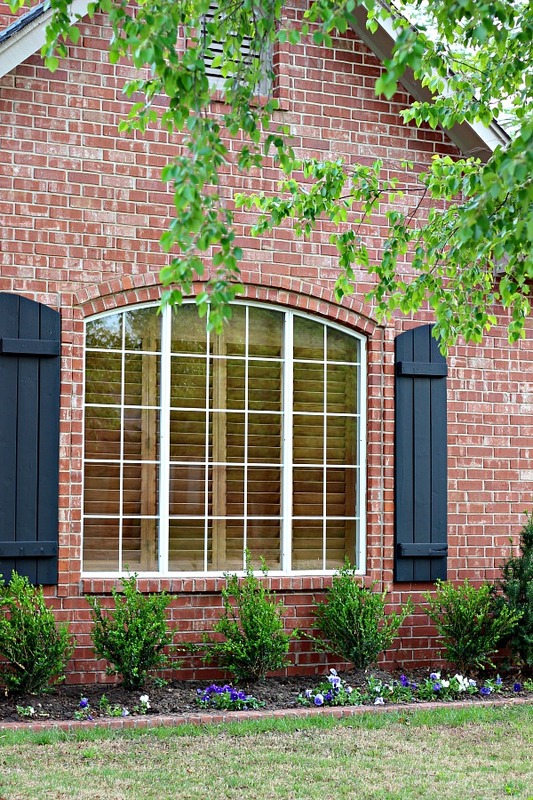 We've got a large window in ours, and we have to have blinds on it or people could see right through the whole house. I didn't think about reclaiming one! Hey Kassie! I'm still trying to pin down a date, but I'm planning to give a shout out when we're getting close! So happy to see you mention On Sutton Place..Ann is one of my favorites to follow. Excited to see that you follow her too. If Lego boxes become collector's items, I will be able to retire!!!! 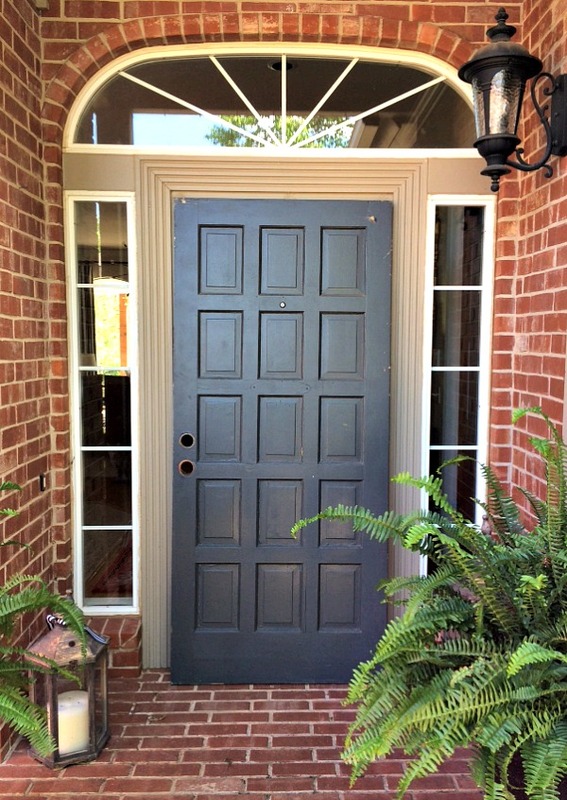 Your new front door is such an amazing find! I love the paneled detail and can't wait to see what color you paint it! Wow, what a great deal on the new door! It will be beautiful. The beds look like they will also be fabulous! Thanks for the updates! This is so exciting! 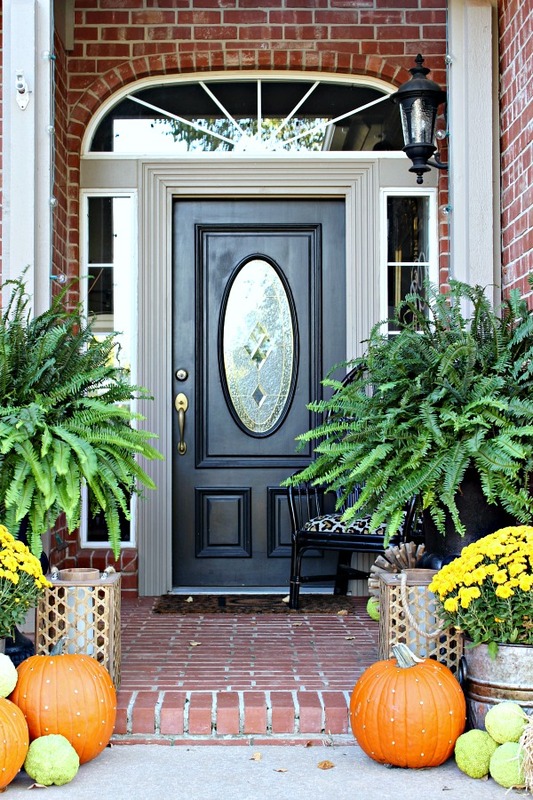 A front door can make or break a house. I LOVE the blue and in fact had just looked at Ann's door before shooting over to your site. Crazy right? I have been helping a friend renovate her home inside and out. We had planned on a new front door but with all the other things we were doing, we had to cut the budget somewhere and the door had to go. 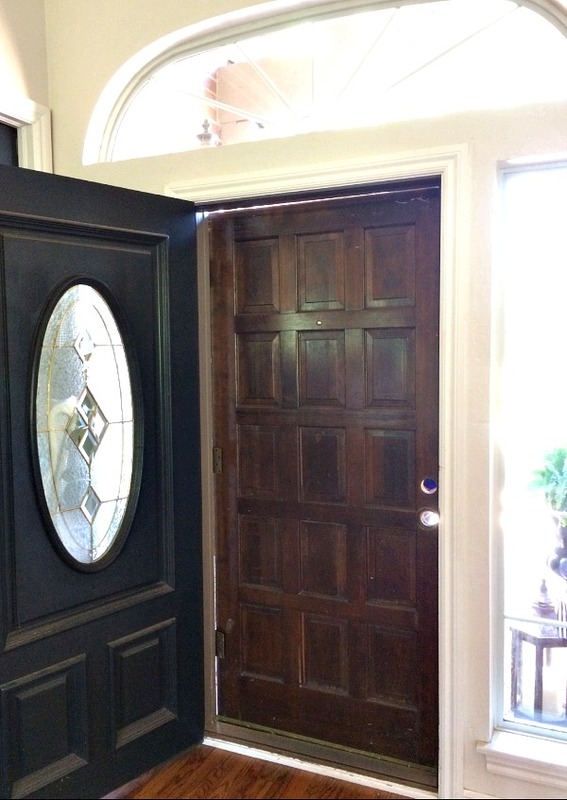 Turns out with new paint, keeping the current front door was what the house needed and it looks so nice. I hope to be sharing some before and after photos soon. We also took out ALL of her landscaping and as I write this comment, the new plants are being installed. I love your boxwoods and can't wait to see your backyard. Good luck with everything. You have a lovely home! Oh, we're definitely keeping the legos themselves, it's just the BOXES that he can't let go! :) When my kids were little and went to grandparents' houses, our toys from when we were little were always their favorite things to play with! Totally agree with Carla's comment. I now have 4 grandkids and I'm so happy I saved "some" of my kids things, especially 100 little Golden Books. Starting in the mid 1970's they were 49 cents and now I see they are close to $4.00 and the paper and colors are not the same. Original Star Wars toys, My Little Ponies, Strawberry Shortcake all made in US, not China. My grandkids loved playing with them. Also; wonderful pick on the door; it looks like it was made for the style of your house; it will be beautiful in blue!